Thorough the preparation for MCAT/MDCAT as per UHS syllabus comprising Lectures, Tests & comprehensive discussions according to STARS Academy scheme of studies. Step-II will be the continuation of Sunday Session which includes remaining preparation of STARS Scheme of Studies. Step-IV is the final or main round of MCAT/MDCAT preparation containing “FIVE�? Full Length Papers consisted of the questions from MCAT/MDCAT past papers ensuring the final revision for the final test (MCAT/MDCAT). Candidates having qualification equivalent to intermediate (Pre-Medical) are eligible to apply for admission in LMDCAT Test. The equivalence of qualification is determined by Inter Board Committee of Chairman, Islamabad(IBCC) Further Information Contact with Stars Academy Lahore. Candidates must have a minimum score of 660/1100 marks in F.sc (Pre-Medical). The candidate having domicile of any district of Punjab can appear in the Entrance Test of the Punjab. In accordance with the regulations of Pakistan Medical and Dental Council, there is no maximum or minimum age limit for appearance in Entrance Test of LMDCAT. Biology has 88 No. of MCQ's. Chemistry has 58 No. of MCQ's. English has 30 No. of MCQ's. Physics has 44 No. of MCQ's. 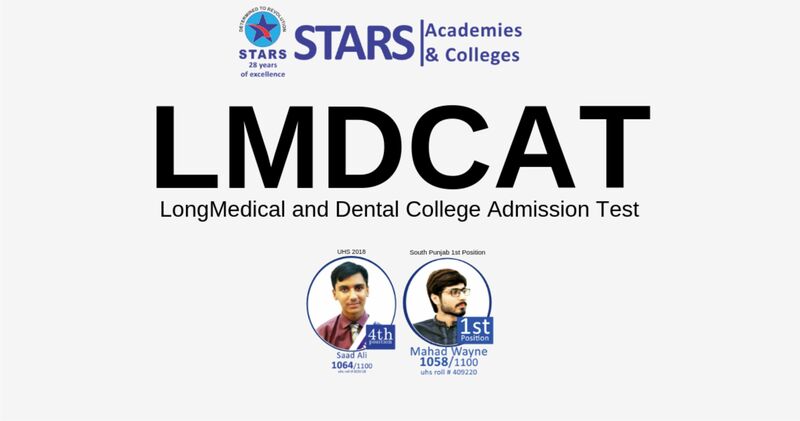 The Long MDCAT (Medical and Dental College Admission Test) is necessary to get admissions in public and private sector Medical universities and Colleges of Pakistan.